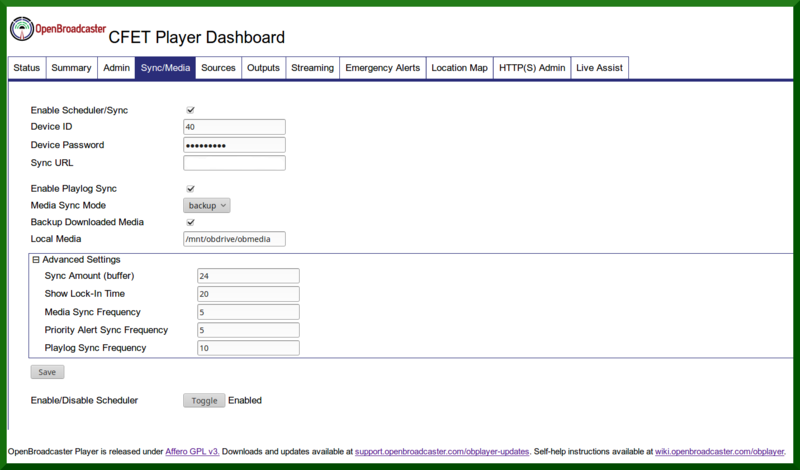 Player configuration and status monitoring is accomplished using a Dashboard interface. The Dashboard is available in a web browser, on port 23233 of the localhost IP address (i.e. //localhost:23233). In headless mode, the Dashboard is accessible using the local area network address of the Player (e.g. //10.0.0.100:23233). 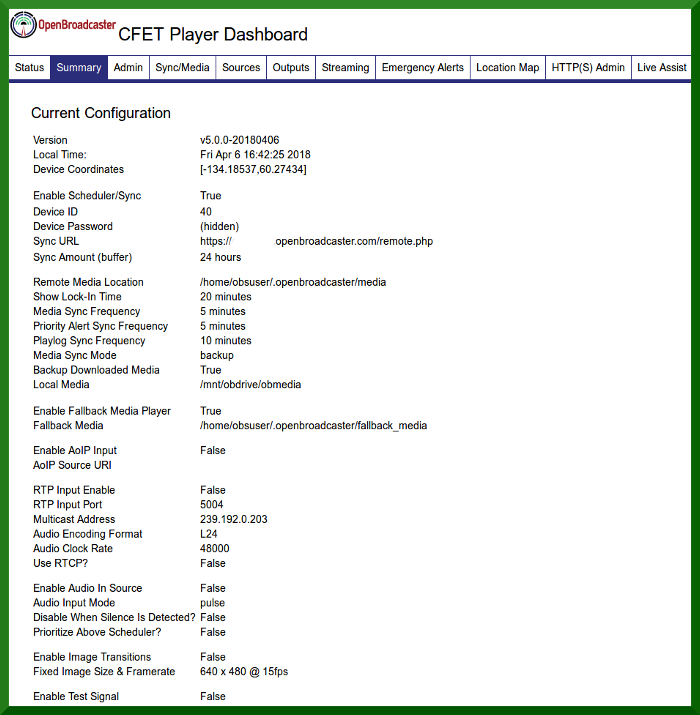 For access to the Dashboard from outside the local area network, contact your network administrator to setup port forwarding on your router.. The Admin user can change configuration settings of the Player as required for activation in a broadcast setting. The changes that are required in each case are reviewed in Getting Started. Additional settings for each tab are reviewed on this page. NOTE: Be sure to Save any changes on each Tab, waiting for a green confirmation message then restarting with the Quit button to take effect. If audio or video modes are changed, a reboot will be required. displays real time information for the current state of the Player. If audio signal is present, a signal level indicator will respond to output from both audio channels. All system operations are displayed on a real time Log displayed on the Status Tab. Normal system operation Green Text. Player and Now playing Green Text. CAP XML Alerts received Lime Green Text (Only in Debug mode). CAP Alert playout and NAAD connection Magenta Text. displays all current configuration settings. is visible to the Admin user only. Advance Settings control visibility of Tabs for Read Only user access. Export or Import settings to save or restore the configuration, if necessary. To create a backup of the configuration export the settings. To restore a configuration, import the settings file. Configuration settings are output in plain text form, excluding passwords. This file should be kept in a secure location. The current settings may be exported as a text file from the Admin Tab Settings file and passwords Passwords will not be exported or revealed. Restoring the settings file will reset the player dashboard passwords to default (admin) retaining the created user account. Once the player has been restored, simply login with the user and default password and change in the Admin tab to your desired password. Reset to Defaults will restore the default configuration. Current configuration parameters will be overwritten, but may be restored from the backup settings file. 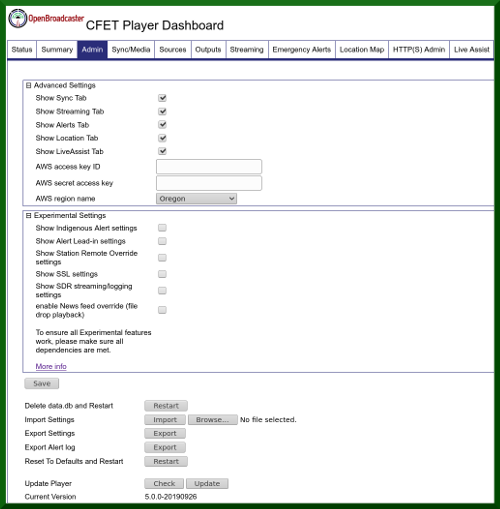 Update Player allows the user to confirm the installed Player version, check for updates to the Player software, and if desired, retrieve and install the updates. Changes will not take effect until the Player is restarted. Obplayer loads Fall Back Player on startup that checks to see whether something is playing or about to play. 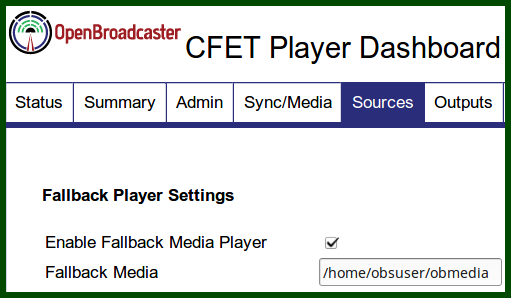 If nothing is playing and nothing is about to play, because of missing or corrupted media, a missing DPL or blank schedules obplayer has the intelligence to locally play from the “Fall Back Media” directory so no dead air. 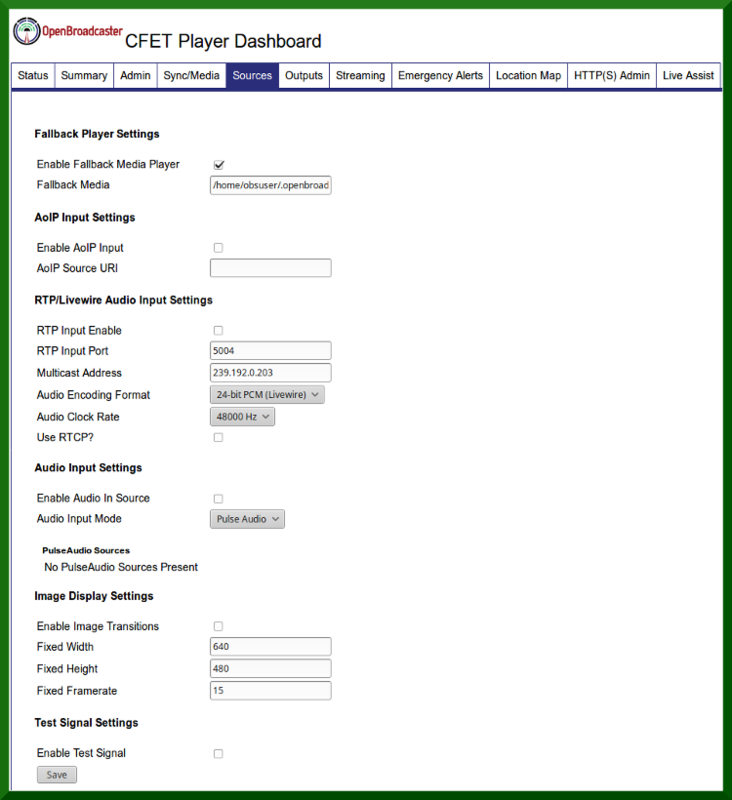 In the player dashboard under Sources enable and place media into location specified as Fall Back Media. Auto scans sub folders created to separate audio, image, video media. Fallback media directory items are played at random, all items will be played before any media items are played a second time. Default is 15 Seconds for image display. TIP Set up with Polka music in Fall Back directory. Hearing Polka, indicates something is up with player that needs investigating. 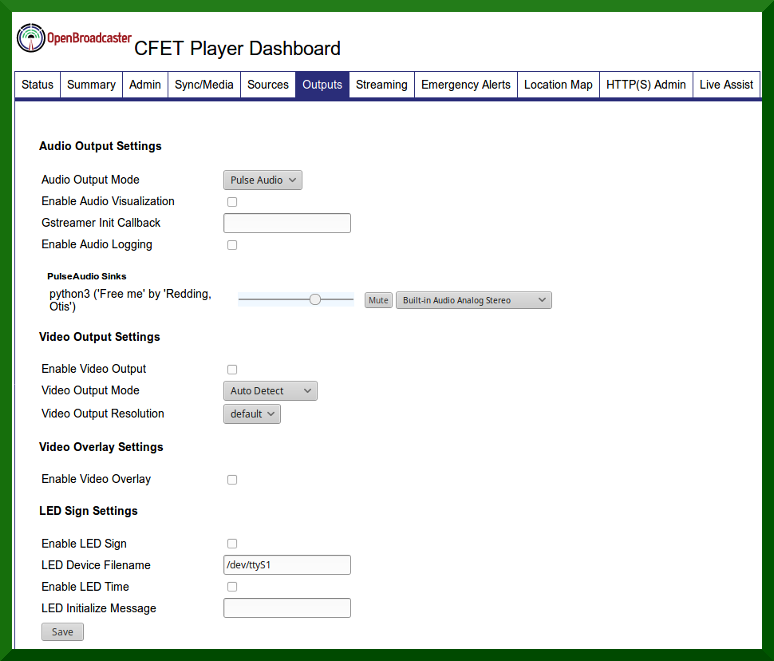 enables the Player to receive and broadcast Alert Messages. Please refer to the National Public Alerting System Common Look and Feel Guidleines for more detail on specifications and recommended practices relating to public alerts. GPIO Trigger provide for a RS-232 Port to issue a DTR serial signal upon commencement of CAP-CP Alerts. When an alert cycle starts, the serial port will be opened and the DTR control signal (positive pin voltage) will be transmitted on Pin #4 of a common DB9 connector. After the alert cycle has completed, the DTR signal will drop (negative pin voltage). Lead-in Delay timings may be adjusted to prevent ‘clipping’ of messages. A Standard Geographical Classification uses a numeric code to identify discrete areas, based on census districts. Use the map below to find SGC codes in your area. Use a comma to separate multiple SGC codes as a list (without spaces). For example, the town of Haines Junction (Yukon) is “6001018”; the village of Tagish (Yukon) is “6001036”. To include alerts affecting both districts, “6001036,6001018” would be entered into the textbox. Alternatively, entering “6001” would capture both districts, as well as any others in the immediate locale. 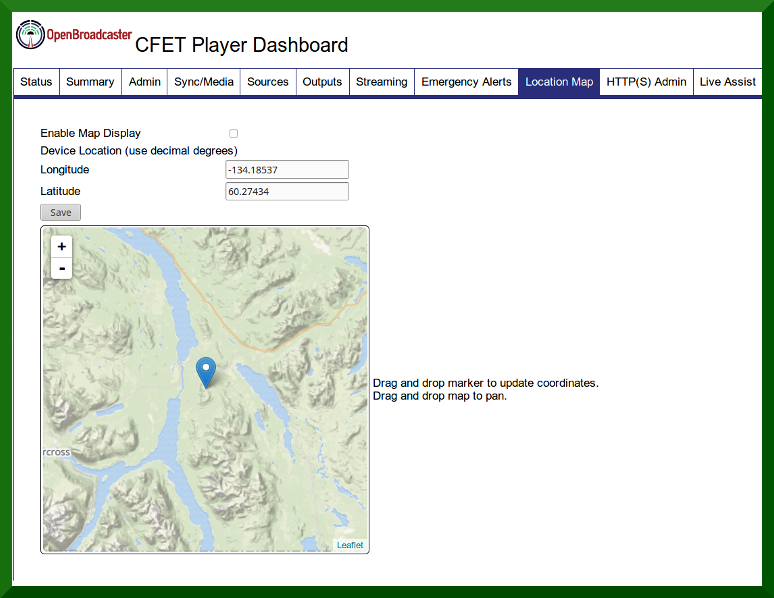 Alerts will be filtered to include only those that match, contain, or are contained by the set Alerting District. Pulse](#pulse) is the default tool for adjustment of output levels for all installed sound cards in Ver 5.X Series players. Pulse and JACK are both supported audio modes, either will produce sound quality suitable for broadcast. Files containing user and machine settings are located in the .openbroadcaster folder within the users home directory. The Admin Tab provides utilities for backup and restoration of user settings. The data.db contains a copy of media scheduled for the period identified by the sync buffer (default 24 hours). 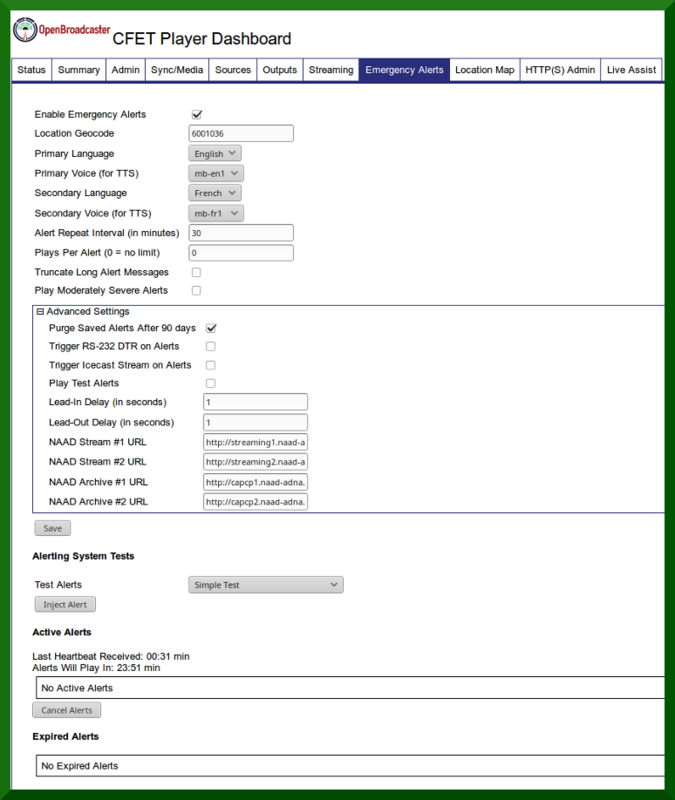 Delete data.db and Restart to purge the Player and force a refresh of the database, schedules and media according to the current sync settings. Useful when changing backend services. settings.db contain the player settings in an sqlite db. Lost passwords may be recovered by editing this file. 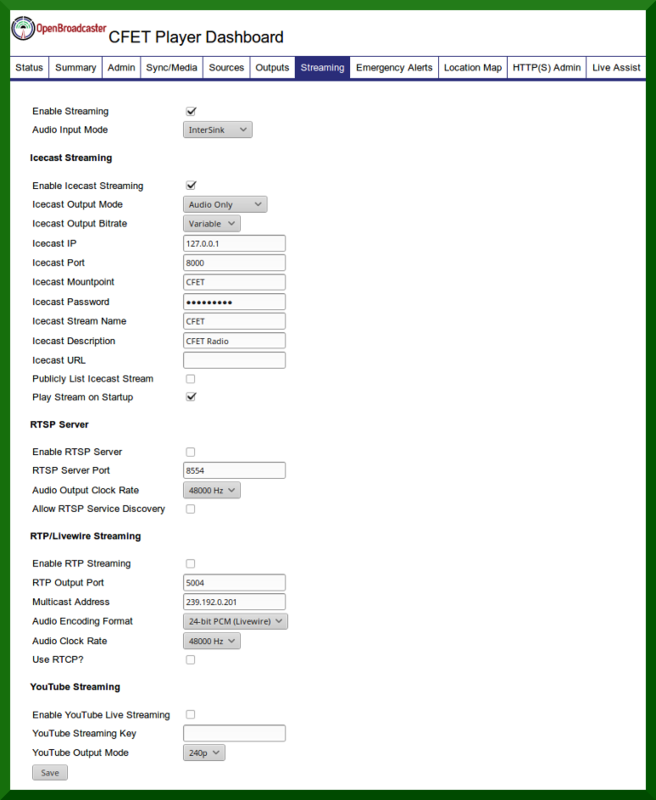 JACK uses port names openbroadcasterout and openbroadcasterin respectively, with a jack.plumbing configuration to maintain the connection state. ALSA Mixer may be used to control output levels when using Jack, however adjustment of input levels ( e.g. for line-in source) requires jack-mixer, and modification of the jack.plumbing setup. See Troubleshooting for guidance about the connection definitions. Find a bug ? Have a feature request?